Rhapsody in Blue catapulted George Gershwin into a world-famous career. It brought jazz into the concert hall using a musical language that was fresh, spontaneous, and uniquely American. 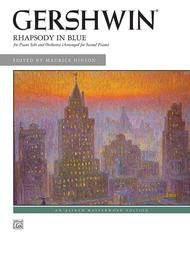 This edition is based on the 2-piano version, first published in 1924 by Warner Brothers Music Corporation. Editorial pedal and fingerings are included. 48 pages. A Federation Festivals 2016-2020 selection.